In honor of Charles Darwin’s 200th birthday today (by the way, he was born the exact same day as Abraham Lincoln!) 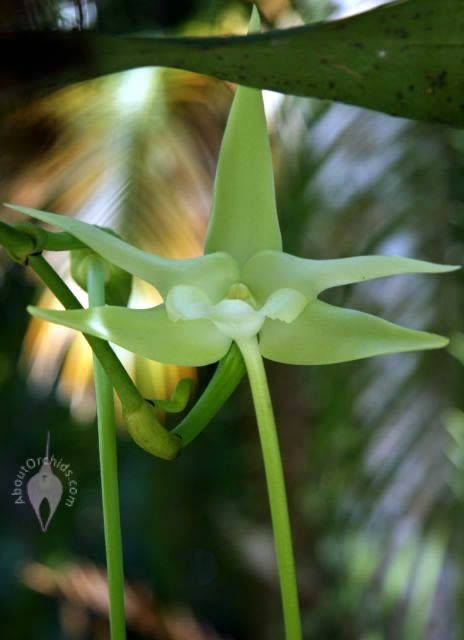 I have some remarkable pictures of “Darwin’s Orchid.” This stunning orchid has a long scientific name, Angraecum sesquipedale. Easier to pronounce is its nickname, Darwin’s Orchid, so named since it played an important role in the development of the theory of evolution. I was thrilled to find this exquisite specimen in bloom at Hawaii Tropical Botanical Garden last month. Although it was up in a tree and difficult to see, Dave’s superb photography brings us up close. Darwin was fascinated by orchids, and tried to understand how they evolved to attract a single insect or bird species to pollinate them. 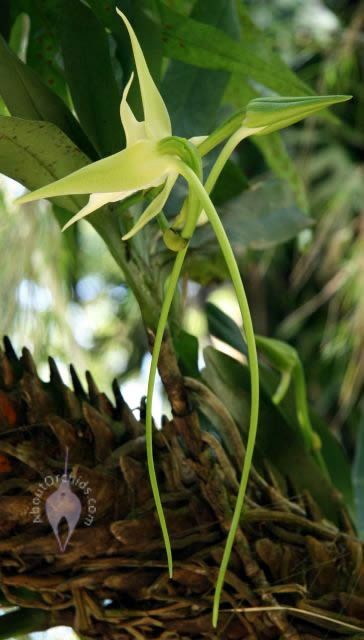 This orchid presented a particular challenge for Darwin, since its flower can have a 14 inch (35 cm) nectar tube. Darwin theorized that somewhere in the jungles of Madagascar, there was a moth with a very long tongue capable of reaching the bottom of the nectar tube, and which was the pollinator of this orchid species. He was ridiculed for the outrageous suggestion, but the predicted moth species was discovered in 1903, proving him correct and adding compelling proof to evolutionary theory. Pictured below are an open flower and an unopened bud positioned back to back. Dave worked some computer magic to make the flower and nectar tube really stand out against a black and white background. I estimated, using the picture with my hand, that the nectar spur on this flower is a respectable 10.5 inches (27 cm) long. 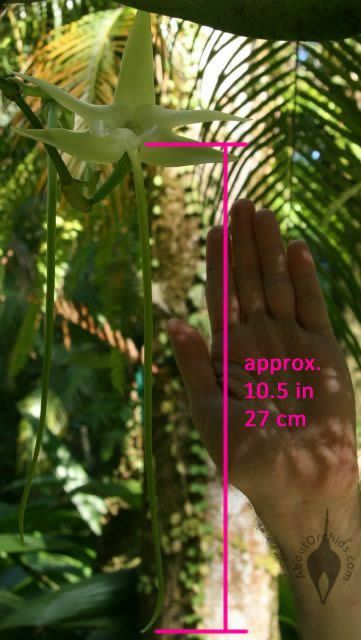 That’s still 3.5 inches (9 cm) short of the maximum length this species can achieve for just one segment of the flower. 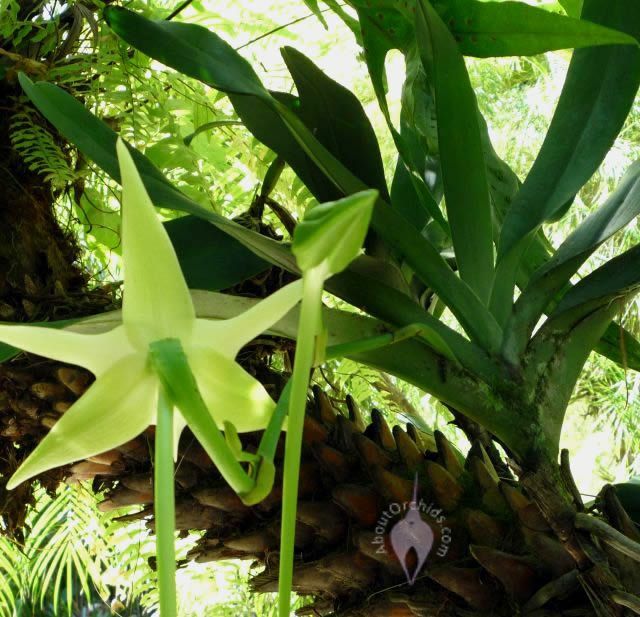 The final shot shows part of the Angraecum plant itself on the right, looking like a Vanda plant, while its roots hold on to a palm tree trunk. 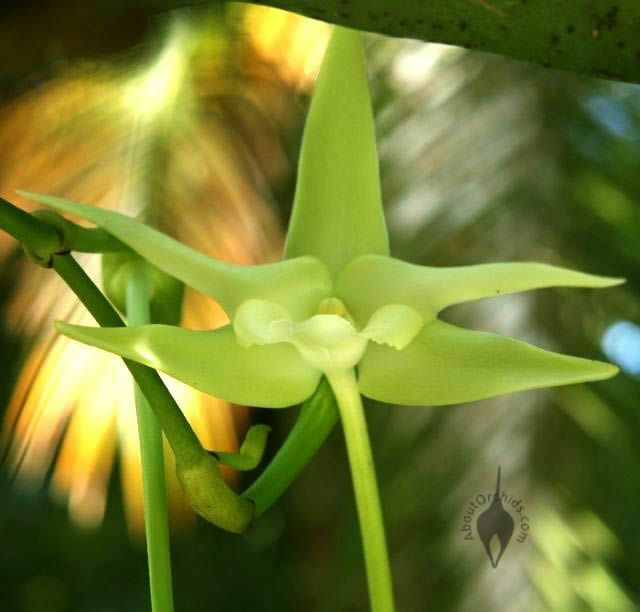 This remarkable orchid is a fitting birthday tribute to Darwin’s profound contributions to modern science. This entry was posted on Thursday, February 12th, 2009 at 11:21 am	and is filed under Botanical Gardens, Fragrant Orchids, Misc, Photos, Warm Growers. I saw a TV show where they showed that orchid and a moth unrolling its long tongue to pollinate it. But your pictures are better! The moth visits at night. I really like your website , it’s filled of lot of information. You have earned one constant visitor and a fan of this webiste.